up quite a few jewels. WHAT A DELIGHTFUL WELCOME  the clear, tinkling chimes of the bells overhanging the front of the grand, cannon fronted, Town Hall striking melodically as we approached the village of Willemstaat's yacht lined quay. 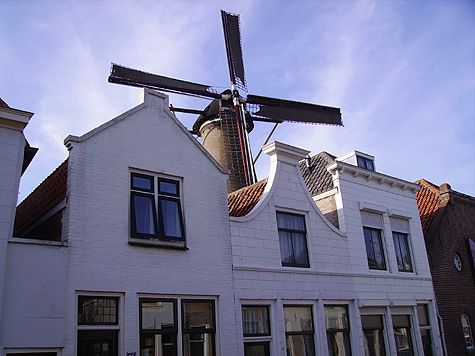 The Town Hall's pomp and scale was in contrast to the small community which nestled around the quay  the only other large building was the working windmill at the opposite end of the quay. The sight of the classic Flemish houses around the harbour was anim-ated by people sitting al fresco at two bars and the whole enchanting vista was bathed in the soft autumn sunshine. A short relaxing and romantic stroll through the village's narrow streets was rewarded by the sight of a cornucopia of flowers on a stall at the weekly market at, literally, a fraction of the UK prices. This enchanting, partly-fortified village is located on the quiet south western coast of Holland. We had eschewed the normal airport agonies and anxieties for our short break. Seeking a combination of a quiet, historic village, good food and a hotel brimming over with character, we had chosen Veere, near Middleburg in Holland. This proved to be a good choice as Veere appeared on few maps and was ignored by most of the web route planners. The independently-owned hotels that comprise the Romantik Hotels have always proved to be interesting, of high quality service and offer-ing just that little bit more. Our choice of the Auberge De Campveerse Toren was no exception as it is arguably the oldest hostelery in Holland, with its fortified tower dominating the quay. Hospitality has been offered here for some 600 years and everything is steeped in history from the antique furniture through to the massive beams. The only exceptions were the staff and bathrooms  both were cheerful and modern. 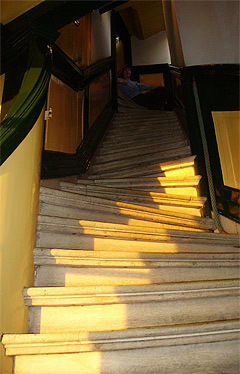 The stairs to the first floor were a challenge. They were heavily worn, and any Scotsman would have turned them over long ago! Maybe during 600 years of use they had already been turned over, but they certainly were characterful. At the top of the tower is a bar reached by climbing the steep, but not badly worn, tortuous stairs  an achievement that needs a celebratory drink; but the sobering thought of descent was the constraint on consumption. This was soon over-looked as the massive timbers all around the room created a great atmosphere and the views from the window seats across the water-ways and village were to die for. The largely candle-lit main dining room far below the top of the tower has been the venue for many a grand celebration  including the wedding breakfast of William of Orange (a forebear of "our" William III) and his bride, Charlotte De Bourbon, in 1575. There is a smaller dining room for individual parties and everything there is straight out of the history books so that our modern clothes were sorely out of character. But we had not come to Holland just for the cobbles  girls, they ruin decent shoes  or the canals and the medieval streets with their Flemish stepped houses. We had come to sample some of the best food available in the area, and we were not disappointed. Our 'surprise' menu offered us new tastes and experiences enhanced by the flicker-ing candle-lit view of the lake  truly romantic even after over thirty years of marriage. Our dinner started typically with old jenever (a type of gin) with a chaser of local beer, and was accompanied by seaweed biscuits (think anchovy), cheese, black olives, almonds and rye bread. But this was just the beginning. A courgette mousse accompanied by a dried ham reminiscent of Black Forest ham was truly historic, followed by a potato soup with smoked eel. Now I know the British have a phobia about eating eels  which our continental friends simply cannot understand  and I am in two minds myself. However, this smoked eel was simply delicious and I cannot wait to try some more. Forget jellied eels, these were something else! You would think that we would not have had room for more but that is, of course, not true. The halibut again was accompanied by eel, the seabass with bacon and red wine sauce, the wild duck in a fruit sauce and finally a sinful pudding, accompanied by a fruity chardonnay and Spanish red wine, was a true feast. This was a Monday night and the restaurant was almost full with both families and couples. A true test-ament to the local reputation, attentive service and food of the hotel. We were puzzled as to why such a very small community had such a large church. It turned out that Veere once enjoyed a highly profitable European wide monopoly on importing Scottish wool to supply, amongst others, the famed Flemish weavers. Today the grandest houses along the quay are still known as the "Scottish" houses. Zierikzee is a much larger village, but more of a town compared to Willemstaat. It boasts a couple of sixteenth century town gates on the approaches, plus a separate harbour to the open town quays. 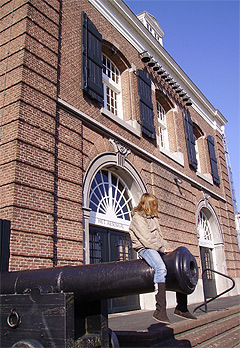 Along the traditional cobbled streets are the gabled classic facades and one building stands out as extremely forbidding  it was the town jail, but is now converted into a maritime museum. This picture postcard is completed by a collection of traditional vessels in the harbour. Again, its stature with its grand houses must have been more important than the present day proportions would indicate, as it was a major trading port with the towns of the Hanseatic league. On a grander and larger scale is Middleburg itself. There is street after street of houses dating from the Middle Ages to the sixteenth century. If ever one wanted to demonstrate the spread of the wealth of Holland's dominant trading success in the past, cross the bridges of the waterways into Middleburg and explore this example of an historic and powerful sea trading town. All of these communities have a vibrancy and continuing success as all the houses and streets are beautifully presented. There is not even a tiny bit of flaking paint evident. That needs both the right attitude and money, and there appears to be no shortage of either. A visit to the Royal Delft porcelain factory proved to be fascinating as they are the sole survivor of an industry which had supported up to thirty-two earthenware factories until the eighteen hundreds. 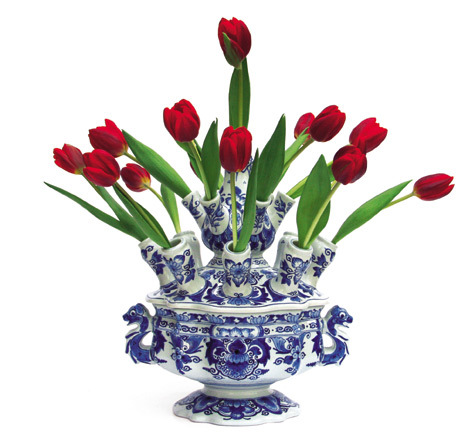 Delftware started out as the Dutch answer to the blue and white decorated Chinese porcelain that was all the rage in Europe in the early seventeenth century. This three-hundred-and-fifty-year-old company had as many employ-ees at one time, but times are hard and the payroll is down to sixty which includes sixteen painters. The quality is high and of note, we were surprised that the traditional blue and white porcelain starts out as black and white, the blue only coming through upon baking the cobolt, so obtaining the correct shading is extremely skilful as there is only one chance of getting the right weight of paint and thus the right shade. 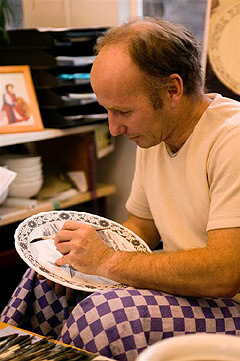 The market for the traditional Royal Delft is obviously increasingly limited but looking at their historic collections, they have a real treas-ure trove which is currently not exploited. Their very sharply designed tea sets of the 1920's and their architectural pieces have great appeal. Excitingly, they have recently discovered numerous tiled displays which had been walled up, and they are in the process of revealing these beautifully crafted designs. A newly appointed marketing manager, Saskia, is looking to produce more contemporary pieces which hopefully will revive this grande dame of European porcelain. A change of pace and technology from Royal Delft, we ventured onto the bland man-made Flevoland. This is a great feat of engineering creating a vast tract of agricultural land. However, it is largely devoid of any interest, with possibly the only exception of the Spyker car factory. How they can have created two really offbeat but very successful designs in an otherwise bland environment is even more credit to them. We were made very welcome by Peter Van Rooy, who treated us as well as his well-heeled customers. Rio Road Rally feature) so he had already experienced first-hand how they perform on the road. They are also innovative salesmen as cust-omers have a secure web link to a 'spy camera' which is positioned above their particular car in the spotlessly clean factory. This enables the customer to follow the progress of their car's six-week build. Still on the innovative side is Spyker's new 4x4  the D12 Peking-to-Paris  which brings a smile to everyone's face. This comes from someone who would dearly love to be able to remove all power assist-ance from 4x4 vehicles. It follows that only the people who use the off road and towing capabilities of these vehicles would be able to drive them. However, the Peking-to-Paris is so outrageous and stunning that it really deserves its success. And, success it already has achieved with orders for some two hundred and fifty units before being put into production. Buy the vehicle, watch the shares! Worth more than just a mention was our Channel crossing. Norfolk Line  formerly regarded as essentially a freight carrier  is now more than a fully-fledged competitor on the Channel. Their route of Dover  Dunkerque is ideal for Belgium, Holland and travelling south, whilst their ships are very modern and comfortable. We travelled on the oldest of their fleet of three vessels that was just over two years old. Our fellow travellers were quieter in style than elsewhere as they currently do not cater for foot passengers and coaches. Add in a truly welcoming, courteous crew and it makes for a very enjoyable break of under two hours in your journey. If you have had a long journey to the coast, it is really worth considering paying the extra for the equivalent of 'Club Class' with its complimentary refreshments and snacks.